Travel Souvenirs of the Strange Variety – or – My Name is Raveburbleblog and I am a Relicaholic. R-Expo and their delicious natural goods. Delhi, India. In 2005 when I was leaving India to return home, I’m pretty sure that technically I was kicked out of the country. It was my debut overseas trip and also the first time I could afford to buy whatever the hell I liked, within reason – we’re not talking a Maserati or a luxury yacht here, and I have no inclination to have my own exotic python zoo either. I’m talking about getting a few clothes tailor-made, treating myself to a nice piece of turquoise and silver jewellery, buying odd, dusty brass items from that hole in the wall shop five alleyways past the cyber cafe with the public urinal outside it, or going to R-Expo and indulging in my ecologically created, natural ingredient incense, soaps, shampoos and perfumes enough to last for an entire year. It was really when I came across Janpath – a row of Tibetan shops in Delhi – that I came a cropper. 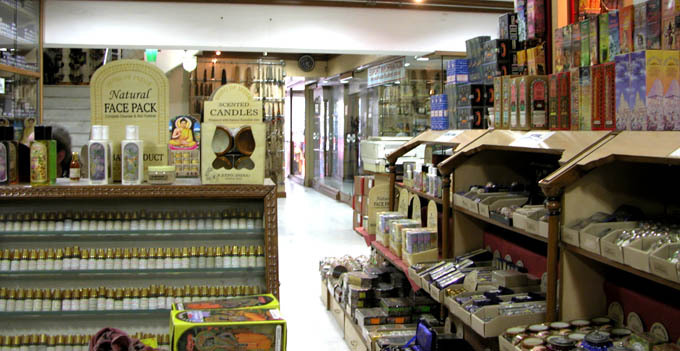 Shop after shop of Tibetan goods. Did I mention turquoise jewellery? Beaded belts and cellphone holders, Buddhist items, brass items, prayer flags, miniature replica Singer sewing machines, anciently devised astronomy instuments… I blame the Tibetans. Yeah. It’s their fault I had to wear fifteen necklaces, eight anklets, twelve bracelets, a couple of beaded belts, six toe-rings and half a dozen beaded cellphone holders when exiting the country. The miscreants! And the Indian guy in the hardware shop three doors down from our guesthouse wasn’t much help either. Fancy selling people beautiful, large, ornate brass padlocks like he does. I had to wear trousers with heaps of pockets to stuff them in, due to my luggage being twelve kilos overweight already (yes, there was many a guilty party forcing me to buy stuff along the way). Upon my departure from Delhi International Airport, an Indian lady waved a metal detector over me three times and sent me into a wee curtained-off space to strip yet another layer of goods off my beleaguered body. The fourth time it beeped, she exclaimed ‘Oh my God! Get out!’ I think that could count as being kicked out, don’t you? Several times since then I have had Indian Customs gentlemen search through my luggage and pull out wind-up rickshaws, animal-shaped padlocks with mighty spikes through the middle, brass and copper dragon-draped horns, wire motorbikes and other ‘relics’ of my stay in their fine country, and ask me where I got them from. Funny, me giving directions to local people on where to go and shop for stuff they had never laid eyes on before. So anyway, when I wake up in my tiny house each morn, I lie there for a few minutes and look at my ‘relics’ hanging and sitting all over the place, and remember little stories in my head about where I was and the person I met while acquiring this and that object. It really is rather a nice start to the day. 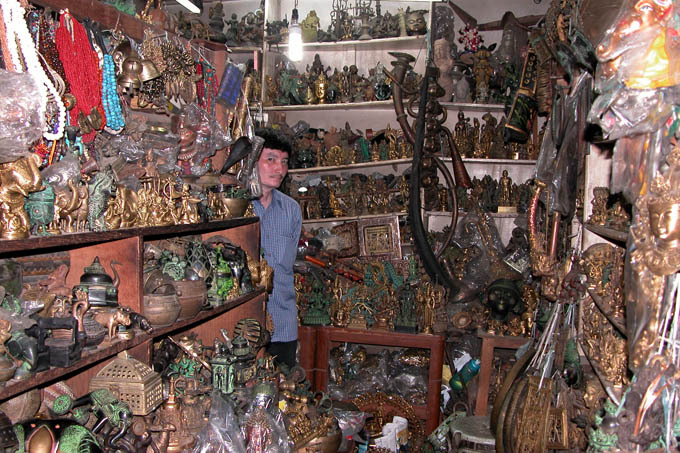 One half of one of the miscreant brass shops in ‘Tibetan Row’, Delhi. This entry was posted in Ravings - random wafflings, Ravings on India, Ravings on Thailand, Tiny House Living and tagged Collecting, India, Luggage, Ravings - random wafflings, Relics, Souvenirs, Thailand, Travel. Bookmark the permalink. Relics? Do children count as relics? Probably not, I guess. I do have a lot of quilts that I love, from dearest Mother. And I think I have started a collection of owls. I have 3, and am eyeing up more in my friend’s shop – that I never seem to leave empty handed. Shall work harder to become more like my relic loving Aunt. P.S. My children love to touch relics. Another reason to acquire a dog run for our visit.